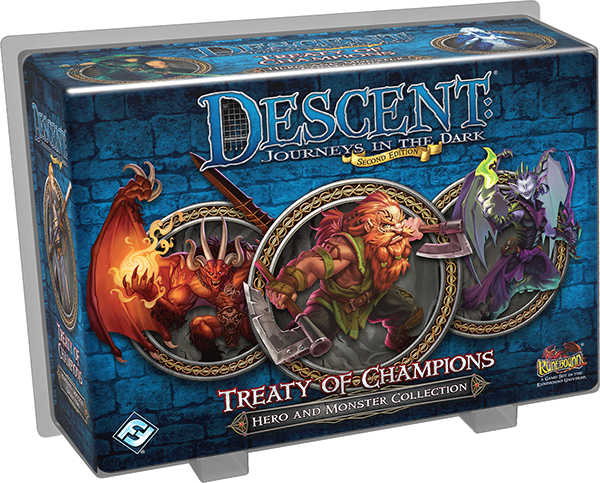 Treaty of Champions contains fourteen sculpted plastic figures to enhance your Descent campaigns. 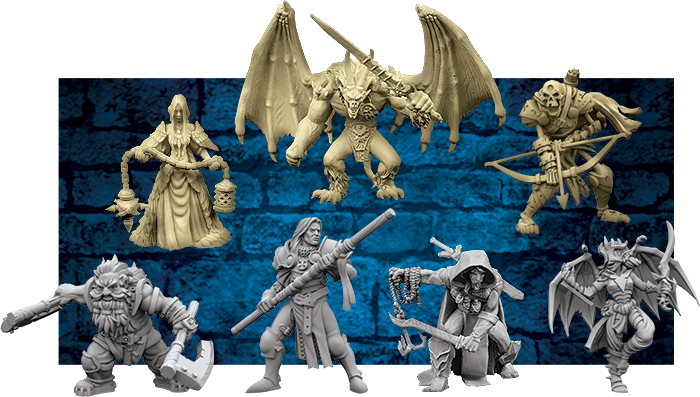 Although the majority of these figures were introduced in the first edition of Descent, this Hero and Monster Collection also features the crow hags: a completely new monster group! Alongside the crow hags, the overlord player gains access to skeleton archers and demon lords, while the heroes can muster four unique heroes – Jonas the Kind, Grey Ker, Krutzbeck, and Zyla. In addition, you’ll find two brand-new quests in this expansion that challenge you to stop an ancient demon from rising again. Contains four heroes, two demon lords, five skeleton archers, and three crow hags. As you embark upon your quest, you may choose to play as Zyla, a mysterious fae from the Aenlong. Few of the fae are seen and fewer are known; their race is caught up in the concerns of their chaotic realm. Even among her own people, Zyla is an oddity. She flits capriciously into the realm of Terrinoth, appearing in unlikely and impossible places to strike down her foes with bloody and malicious glee. Though her purpose is her own, she makes a cheerful and deadly companion and she’s eager to pit her strength against a demon lord. Zyla is just one of the heroes you can play as in Treaty of Champions and her mysterious, trans-dimensional abilities can give her a distinct advantage in battle. As her hero ability, Zyla may enter blocked spaces and ignore the effects of terrain while moving, allowing her to effortlessly pass over water, lava, or other hazards. You may attack a monster from behind by warping over a pit or quickly move across the map when you take paths too dangerous for other heroes. Zyla can also slip into another realm to avoid danger. 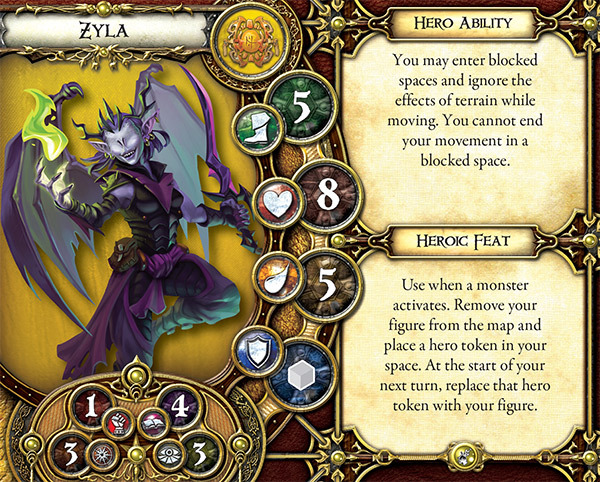 When you play as Zyla, you may use your heroic feat when a monster activates to remove your figure from the map and place a hero token on your space. At the start of your next turn, you replace your hero on the map, but in the interim, you’re essentially immune to any monster’s attacks. Since Zyla has less health than many heroes, the ability to suddenly escape from danger can save your life. Zyla and the other champions will face countless dangers as they fight to bind the demon lord, but one threat that they encounter has never before been seen in Terrinoth. Crow hags are most commonly found on battlefields, but none know whether they consume the flesh of the dead, feast on their cooling blood, or drink the last breaths of the dying. Rumor tells that these women may twist their shape to fly as crows, seeding pestilence and unrest among villages. 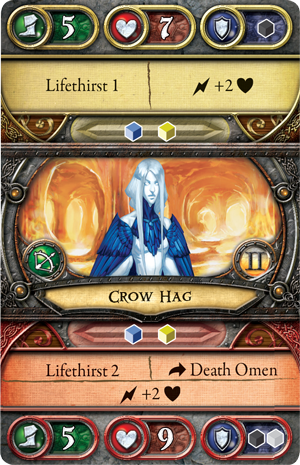 The crow hags are introduced to Descent for the first time in Treaty of Champions, and you can use them to harry the heroes in any encounter. Crow hags aren’t meant to go toe to toe with the mightiest heroes – rather, they hang around the edges, firing pestilence and dark magic from afar. All crow hags can spend a surge to deal more damage, but they also benefit from the Lifethirst ability. 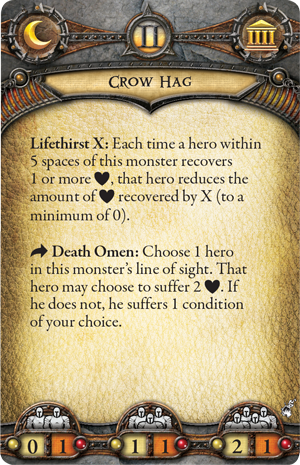 While a hero within five spaces of a crow hag would recover damage, the Lifethirst ability reduces the amount of damage he would recover! By strategically positioning multiple crow hags, it’s even possible to prevent the heroes from healing at all. A master crow hag has another ability that can make life miserable for the heroes. As an action, you may use Death Omen to choose any hero in the crow hag’s line of sight. That hero may choose to suffer two damage, but if he doesn’t, he suffers one condition of your choice! Many heroes will simply take the damage rather than awaiting whatever dread condition you choose to inflict.